Anxiety isn’t fun for anyone, but can be especially tough when you’re a little person facing a great, big world full of new experiences, strange faces, and overwhelming situations. Lots of kids deal with anxiety at some point in their lives; for many, it’s a normal part of childhood in one form or another. There are lots of phrases and strategies to aid your anxious child, but one of our favorites is sitting down together and reading a book that can help your little one identify, cope, and work through her worries. Kids love to see themselves and their feelings reflected in stories, and books are an incredibly useful and easy way to accomplish just that. 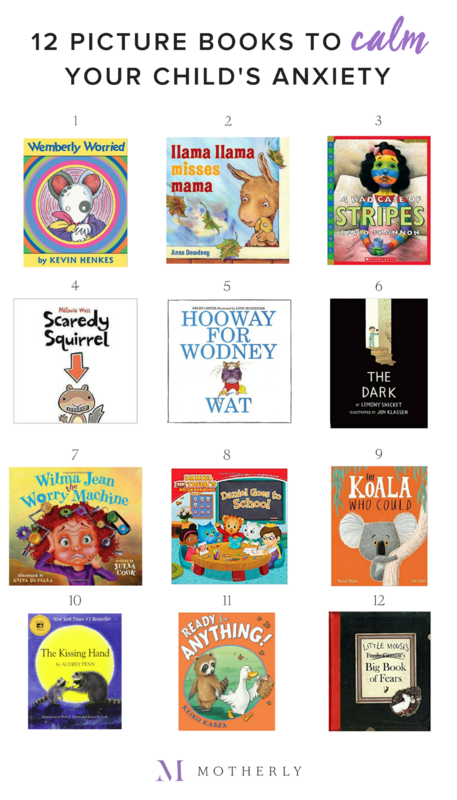 Whether it’s school fears, separation anxiety, or just overall worry—here are 12 books that every parent needs to help calm an anxious child. If there’s a worry worth worrying about, then Wemberly’s your girl. This classic picture book by the beloved Kevin Henkes explores worries both big and small, especially the common fear of the first day of school, and helps little ones identify and work through these feelings. It’s little llama’s first day of preschool, and he can’t wait...until he realizes that mama llama can’t stay. This back-to-school favorite written in clever, catchy verse is the perfect read-aloud for any preschooler with first-day jitters. What happens when you worry too much about what everyone thinks of you? You get a bad case of stripes, that’s what! This vividly illustrated and humorous tale shows kids the way to discovering—and finding pride in—their true colors. Scaredy Squirrel does NOT want to leave his tree; there are too many scary things awaiting him down on the ground. So what happens when he falls out of his nest? This clever, funny tale is perfect for little ones who are afraid to shake up their usual routine and embrace the unknown. When the other rats hear that shy Rodney can’t pronounce his r’s, he becomes the target of lots of teasing at school. As he learns to stand up for himself and overcome his fears of the class bully, kids will gain their own confidence and ego boost along the way. Two award-winning talents team up to tackle the ultimate childhood fear—the dark. Parents will love the beautiful, minimalist artwork and poetic prose, while kids will love the discovery that the dark isn’t actually as scary as it seems. Sometimes all it takes is the normalization of anxiety to make a child feel more in control of his anxious thoughts. This picture book offers children—and parents—the tools they need to deal with any worry and what-if that comes their way. Everyone’s favorite tiger is here to assure young children that “grown-ups come back.” (We can’t begin to count how many times this song has been sung around our house! ?) Pair it with the show’s back-to-school episode for ultimate success! If your little one worries about change, she’ll love Kevin the koala, who wants every day to be exactly.the.same. Perfect for story time and discovering all the joys that can come along with embracing change. The bestselling—and heartwarming—story that has been used for decades by parents and educators to calm children’s worries about the first day of school. Chester Raccoon will quickly become a favorite in your house, we promise! The perfect book to spark the conversation about worry with a young child. We love the characters’ adventurous spirit and the humor throughout. Little Mouse is afraid of...pretty much everything. This creative tale complete with foldouts and flaps will not only capture your child’s attention but will help him face his fears and anxieties. Through affiliate programs, we may receive a revenue percentage if you purchase through our website.